Why does light refract, but sound does not refract? it is understood that light rays travel slower through denser medium (such as water/glass) compared to air. The same is true for sound waves, it has different speeds when it travels through different media. But why does light bend while sound doesn’t? It is interesting that this question does not occur to most students (including me!) when they are studying in school. Sound refracts just like light, but the issue is that we just don’t care as much. Let’s go step-by-step through this. We care far more about refraction of light and far less about refraction of sound because our eyes are able to very precisely locate the source of most light rays, whereas our ears are pretty bad at precisely locating the source of a sound. Where did a particular sound come from? The best we can do is “left” or “right” and “near” or “far”. So, even though sound refraction is happening all the time, we don’t really notice or care. That brings us to the next question: why did our senses evolve in such a way that we can locate light precisely, but not sound? The reason has to do with the fact that in case of sounds in day-to-day life, diffraction is a far more important phenomenon than refraction. Diffraction is the bending and spreading of waves when they encounter objects or slits of a size comparable to the wavelength of the wave. Now, the sound that humans are normally able to hear have wavelengths from 2cm to 2m (more precisely, 1.7cm to 1.7m; by contrast, visible light has wavelengths that are from 400 to 700 nanometers). And considering the number of different things in our environment that are of this size, sound waves are pretty much diffracting like crazy all over the place. Which makes it hopelessly confusing to precisely locate sources of sound. 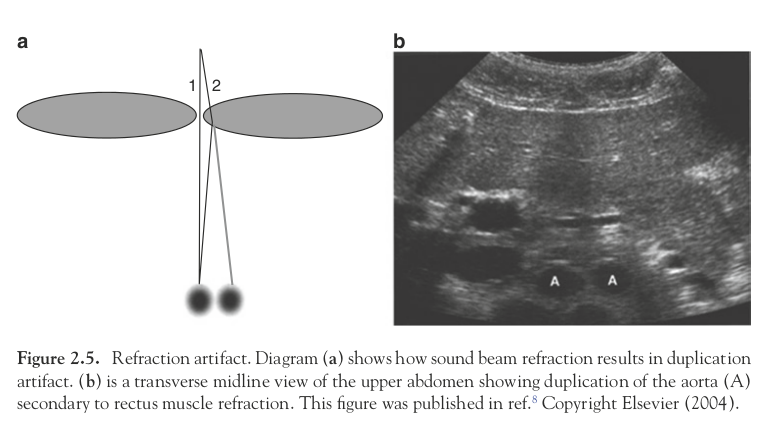 And refraction is an important effect in ultrasonography. Here is a picture, from a scholarly article on ultrasonography, talking about how, sometimes, multiple images of the same thing get created in an ultrasound image due to the effect of refraction. Another interesting artifact of refraction of sound is the fact that sound appears to travel much farther at night or early morning. At night (or on the surface of a water body), the air near the surface is cool, but higher layers haven’t yet cooled down, so as sound travels upwards at an angle, it gets refracted downwards, and ends up travelling as shown in the image. Often, the direct sound path will have obstructions while the path through higher layers of air will be clear. Click here for a page with detailed explanations of various effects related to refraction. If light is going from point P in in one medium (e.g. air) to point Q which is in another medium (e.g. water), then the fastest path to go from point P to point Q (given the speed of light in the two media) is exactly the same path as that actually taken by light after refraction. Here is an interesting math problem which uses this principle. A lifeguard is sitting on a beach, some distance from the edge of the water. He becomes aware of a person drowning, as seen in the figure below. The guard must reach the swimmer in as little time as possible. Since the guard can run faster on sand than she can swim in water, it would make sense that the guard cover more distance in the sand than she does in the water. In other words, she will not run directly at the drowning swimmer. Your task involves determining the optimal entry point into the water in order to reach the drowning swimmer in the least amount of time. The life-guard runs on sand faster than he can swim. Which path takes him to the swimmer fastest? The solution to this problem is to use Snell’s Law of Refraction to determine the path of the lifeguard. The same principle also applies to shortest path via reflection. See Heron’s shortest path problem for an example. The advanced reader is encouraged to try solving the spider and the fly problem and spending some time wondering whether there is any relationship between that solution and Heron’s shortest path problem. On another note, please do start those classes. Perhaps it could graduate to Kabra academy like the Khan academy over time. An online video class will be most welcome at least by parents like me who have to start teaching kids these stuff soon. loved the detailed explanation though will read couple of times more to absorb it fully. @Madhurie, while that is a great idea, the amount of effort involved in creating a good video, editing and uploading it is a little too much for me at this time. If someone else is willing to take this material and create the video, I’d be happy to give permission.